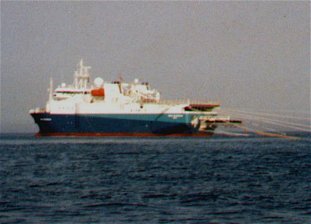 Seismic surveys are conducted using vessels towing air gun arrays. An adult humpback whale seen in the Firth of Forth. 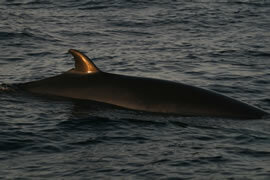 North Atlantic minke whale. These small rorquals are found in high numbers throughout the northern North Sea. Section 9 of the Wildlife & Countryside Act (1981) prohibits the deliberate killing, injuring or disturbance of cetacean species in British waters, and the UK is a signatory to the Agreement on the Conservation of Small Cetaceans of the Baltic and North Seas (ASCOBANS) which requires that range states work towards the prevention of disturbance to these sea mammals, "especially of an acoustic nature". The most prevalent form of marine acoustic disturbance is probably generated by boats. Indeed, there is some evidence from limited research that whales and dolphins avoid approaching ships, and even alter their migration routes, in response to marine traffic. Increasing seismic exploration by the oil and gas sectors in the North Sea, however, is perhaps a more immediate cause for concern. Seismic surveys are conducted using vessels towing air gun arrays; cylinders of compressed air that produce loud, low frequency impulse sounds to build up a picture of the seabed and underlying strata. These underwater sounds are produced at frequent and regular intervals – often over periods of several weeks to months – with source levels greatly exceeding those of most other human activities. Sea mammals in close proximity to the array might be physically damaged by this activity, and those at greater distances may be disturbed in such a way as to interfere with their daily activities, perhaps even displacing them from preferred feeding or breeding areas. Seismic activities may have further indirect effects on cetaceans by causing changes to the distribution of prey species. The risk to these animals could also be increased by their natural curiosity and the fact that inquisitive individuals may be attracted to areas of human activity where seismic surveying is about to take place. Records indicate that as many as 24 different species of whale and dolphin either reside in or pass through the rich, productive waters to the north and north-west of Scotland, making these northern waters one of the most important habitats for cetaceans in Western Europe. The extent to which seismic disturbance from air guns affects cetaceans is not well known for all species at this time, since only limited research has been carried out in this field to date. Most published research relates to the larger baleen whales, but a pattern has recently been emerging that small odontocetes (toothed whales), such as white-beaked and Atlantic white-sided dolphins, may be more susceptible to disturbance from seismic activities than the larger baleen whale species. The CRRU currently supplies mitigation services to the exploration companies undertaking seismic exploration work. These companies are required under licence to adhere to specific guidelines for the minimisation of acoustic disturbance to these animals during site surveys. As part of this requirement, experienced Marine Mammal Observers are placed on survey vessels (1) to record how these guidelines are applied during a survey, (2) to monitor how long the airguns are fired for during watches, (3) to record the sea and weather conditions during observations, and (4) to log detailed cetacean sightings. The most frequently seen species during survey trips in the North Sea are: Atlantic white-sided dolphins, white-beaked dolphins, pilot whales, minke whales, harbour porpoises and sperm whales. 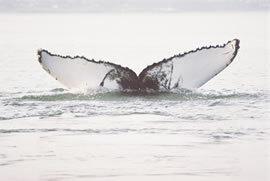 Other species may also include the fin whale, Northern bottlenose whale, killer whale, Risso's dolphin, bottlenose dolphin, Sei whale, humpback whale. For the most complete and up-to-date taxonomic reference of these species in terms of current research in the field of cetacean taxonomy, click HERE. To find out more about the full environmental impact and mitigation services provided by the CRRU, go to: www.vistem.co.uk/environmental.